The woodland origins of the lovely Question Mark and the Eastern Comma can be seen in their trunk perching behavior, their liking for sap flows rather than flowers, and their choice of hibernation sites in bark crevices and wood piles. Although the Question Mark’s traditional habitat is deciduous woodland openings and edges, it was adaptable enough to thrive despite the period of forest loss in Massachusetts. Its numbers were no doubt augmented each spring with arrivals from further south, for this is a strongly migratory butterfly. Some Question Marks apparently over-winter in Massachusetts, but many make a return journey southward in the fall. Thaddeus W. Harris in his manuscripts called Question Mark “a very common species” around Boston in the mid-1800’s. In his personal collection from the area, he had specimens dated 1820, 1821, 1827, 1828, 1834, 1836 and 1839; the earliest was May 1, 1828 and the latest was October 10, 1936 in Cambridge (Harris, Index 1822-50). He referred to it as the Semicolon Butterfly, but Scudder and others preferred the more poetic Violet-Tip. “The caterpillars live on the American elm and lime trees, and also on the hop-vine, and on the latter they sometimes abound to such a degree as totally to destroy the produce of the plant. In the latter part of August the hop-vine caterpillars come to their full growth, and suspend themselves beneath the leaves and stems of the plant, and change to chrysalids. This fact affords a favorable opportunity for destroying the insects in this their stationary and helpless stage...” (1841: 220). But in 1889 Scudder characterized Question Mark as “rather uncommon about Boston, at least of late years,” although he noted that 1887 had been a particularly abundant year. He emphasized that the species' numbers fluctuated greatly from year to year, and therefore the species couldn't be quite as destructive every year as Harris had suggested (1889: 326-7). Still, avid collector F. H. Sprague had no trouble finding specimens around the state. In 1878 Sprague observed Question Mark as early as April 20 in Wollaston (now Quincy, Boston), and collected specimens in Wollaston on September 3, 1878 (light winter form), June 1, 1896 (dark summer form "umbrosa"), July 31, 1895, and August 8, 1894 (Harvard MCZ). Sprague also found specimens in Belchertown in 1878, as well as 12 larvae on hops in Belchertown on August 26, 1878. Larvae had also been found in Wollaston in August and September 1877 (Sprague 1879). Overall, the numbers of Question Marks in Sprague's collection are not as great as the numbers of Eastern Commas. Question Mark was collected in many locations around eastern Massachusetts in the early 20th century, including Tyngsboro (8/24/1919, MCZ); Melrose 1921 and North Weymouth 1936 (Yale Peabody); Stoneham (8/1/1926, C. V. Blackburn, Furman U. ); and Marblehead, Lynn, North Andover, Clifton (Saugus), Malden, Cambridge and Hanover (Farquhar 1934). Between 1940 and 1980 it was collected in Concord (1955, C. G. Oliver, Yale); West Acton (7/28/1962, C. G. Oliver, Yale); Harvard (1957, C. G. Oliver, Yale); Woods Hole (7/29/1973, L. Gall, Yale); Wareham (8/1978, Yale); Sturbridge (9/27/1978, L. Gall, Yale); and in particular Martha's Vineyard (July 9, 1948, and other dates, F. M. Jones, Yale). In the western part of the state, in addition to Belchertown (1, 9/1878, Sprague, MCZ), there are specimens from Amherst (1 June 1896, G. Blay, Yale), Longmeadow (7/15/1977, D. Bowers, MCZ), and Heath (Franklin Co.) (6/1981, S. D. Coe, Yale). Question Mark did not decline as much as some other species during the forest clearing of the 17th, 18th and 19th centuries (Table 1: 1600-1850), precisely because of the spread of nettles, the cultivation of hops, and the retention of elms and hackberries as yard and street trees. The butterfly also made use of the many orchards for rotting fruit, and used any early successional forest areas with elms. These factors also assured its survival through the periods of industrial and urban/suburban development. Hops (Humulus lupulus) is a widely distributed vine of temperate forest openings. Some botanists list it as introduced from Europe, but it is reported as native in Virginia in 1705 (Leighton 1976: 27), and may have been brought north for cultivation. Today, it has a wide North American as well as Old World distribution, and grows wild in glades and edges in all Massachusetts counties except Suffolk, probably having spread from cultivation (Gleason and Cronquist 1991:73; Magee and Ahles 1999: 421). The growing of hops for beer-making began in colonial times, and probably greatly increased the abundance of the hops vine, and of its three associated butterflies: the Question Mark, the Eastern Comma, and the Gray Hairstreak. Historian Howard Russell writes that in 1702 there were “well-known hop-yards at Woburn, Massachusetts,” and that hop growing must have reached some magnitude before 1775, for shipping records show 3,000 lbs being shipped to New York in 1763. By 1806 the state had set strict quality standards for this crop, and required inspections. Several towns in northern Middlesex County, especially Tewksbury and North Reading, were centers of production, and Northfield, in the Connecticut River valley, also produced a lot. Hops were shipped to destinations around the United States and Europe. Most was probably exported, since New Englanders generally preferred cider to beer in those early days. Hops were dried in kilns over pine and oak charcoal fires. The crop was grown here until about the time of the Civil War. In 1840, Massachusetts still produced about one-fifth of the nation’s crop (Russell, 1982: 165-66, 226). Two favorite nectar sources for Question Marks actually increased during the agricultural period – sap and rotting fruit. Scudder tells us they were fond of “sap which flows from wounded trees” and “juices of decaying fruits” (1889:327). Both Question Marks and Eastern Commas benefited from sap flows during the widespread timber cutting and from the fermenting fruits in orchards, just as they do today. Early naturalists delighted in this interesting behavior: “A number of these butterflies will gather on a rotting apple and take their tipple, becoming so absorbed in the treat that they are oblivious to danger and can be lifted between thumb and finger. Until they have reached this state, however, they resent any interference with their pleasure by flying at and about you with rapid zigzag movements” (Robertson-Miller 1912: 179-80). Autumn “tippling” and the use of early spring sap flows are both adaptive behaviors needed by a species which hibernates as an adult over the winter, and then breaks diapause in early spring when nectar sources may be limited. Some portion of the Question Mark population over-winters here as an adult, but some portion also migrates southward, often along the coast. Then in spring, new individuals arrive back from the south to augment the local population. MBC and Atlas records both rank the Question Mark as Uncommon today, relative to such common species as the American Copper or the American Lady (Table 5). Today, the Question Mark is reported a bit less frequently than the Eastern Comma, which is ranked Uncommon-to-Common (Table 5). Question Mark shows a decline in the numbers seen between 2001 and 2009 (Chart 49). Question Mark also exhibits strong fluctuations in its yearly sighting pattern, probably due mainly to variations in the annual influx from areas to the south. Eastern Comma does not show this kind of fluctuation, but rather an upward trend over this time period. A separate list-length analysis of MBC data also found a statistically significant 48.9% decline for Question Mark between 1992 and 2010 (Breed et al. 2012), in contrast to a 104.4% increase for Eastern Comma. Statistics published in the MBC Massachusetts Butterflies season summaries similarly show a bit of decline: the average number of Question Marks seen on a trip was down 43% in 2008, 35% in 2009, and 28% in 2010, compared to the average for preceding years back to 1994 (Nielsen 2009, 2010, 2011). In contrast, Eastern Comma shows a percentage increase in 2009 and 2010. For Question Mark, population levels may be determined by winter conditions in areas to the south, as well as in Massachusetts, but severe winters here can also reduce survival rates. 2001 was an especially good year for Question Marks; large numbers were found on many of the NABA counts around the state: for example, 51 on the Martha’s Vineyard Count, 25 on Central Franklin and Northampton, and 14 on Northern Essex. In other years, the numbers for these and all counts usually run in the single digits. 1998 also shows an especially large number of sightings, but this is almost solely due to an apparently large coastal migration: 198 were reported on 9/12/1998 at Westport Gooseberry Neck, B. Cassie, and 25 at Gosnold Penikese Island, J. Sones. Apart from the migration, it seemed a normal year inland. 1994 was another big year for Question Marks, mainly in western Massachusetts: 28 on the Central Franklin NABA count on 7/9/1994, 10 on the Southern Berkshire, and 9 in Northern Berkshire, and good numbers were also reported from the Boston area, Medford and Newbury. Finally, 2007 was also a decent year, with 25 reported on the Northampton Count, 10 on the Central Franklin, and 9 on the Northern Essex. After a downward trend since 2001, 2012 turned out to be an enormous year for Question Mark sightings, due mostly to a large influx from further south. For instance on 4/17/2012, 15 Question Marks arrived suddenly at Wellfleet Bay WS, where none had been seen the day before (M. Faherty), and on 4/21/2012, 25 dark summer form migrants had arrived at Pilgrim Heights in Truro on Cape Cod (B. Nikula et al.). In May, 49 were counted at coastal World's End Hingham on 5/12/2012 by B. Bowker. Larger numbers than normal were found on most of the midsummer NABA Counts. But the influx seemed to taper off by the end of 2012, and no large numbers of returning migrants were reported at the usual coastal migration traps. The following year, 2013, numbers seen were very low. From 1991 through 2009, MBC and BOM had records of Question Mark from 146 out of a possible 351 towns (Map 49). The years 2010 through 2013 added 25 more towns, for a total of 171. This species is well-distributed across the state, inhabiting all major regions, from the Berkshires to Cape Cod, Martha’s Vineyard and Nantucket (Map 49). The 1986-90 Atlas map shows a similar picture, although at that time there were no records from Martha’s Vineyard or from many towns in southeastern Massachusetts. 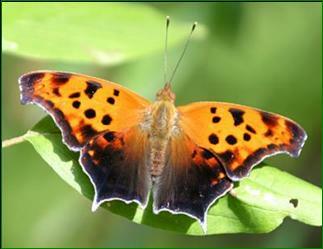 Historically, both Question Mark and Eastern Comma have been present on Martha’s Vineyard and Nantucket, but Question Mark is the more usual species on the islands. Question Mark was reported to be "resident but never abundant" on the Vineyard in the 1940's; one of its host plants was hops vines (Jones and Kimball 1943; specimens at Yale). There are six Vineyard specimens from April through August 1948, by F. M. Jones, in the Yale Peabody Museum. The current Vineyard checklist ranks Question Mark as Uncommon, and Eastern Comma as Rare (Pelikan 2002). On Nantucket Question Mark was recorded as "occasional" in the 1940's; one of its host plants was Chinese Elm (Jones and Kimball 1943). Early specimens can be found in the Maria Mitchell Museum. The 1986-90 Atlas recorded an impressive total of 10 at elms along Main Street, 8/11/1988, and MBC has Nantucket records from July 1995 and October 2006 (Tuckernuck, S. Perkins). Today, Question Mark is thought of as a breeding resident, unlike the Eastern Comma, which is an uncommon stray (LoPresti 2011). Question Mark has also been found on other islands, such as Nashawena and Penikese, as Atlas records indicate. Mello and Hansen (2004) list many good locations for Question Mark on Cape Cod, and species is common there, unlike the Eastern Comma. Question Mark has been found on all of the NABA counts in one year or another. The highest and most frequent Count reports are the following: Concord (nearly every year; max 6 in 1995); Bristol (3 in 1994 and 2001); Central Berkshire (nearly every year; max 12 in 2001); Central Franklin (nearly every year; max 25 in 2001); Foxboro (nearly every year until 2000; max 10 in 1995); Martha’s Vineyard (variable; max 51 in 2001); Northampton (every year since 2001; max 25 in 2007, 24 in 2001); Northern Berkshire (nearly every year; max 5 in 2007); Northern Essex (max 14 in 2001); Northern Worcester (nearly every year; numbers not large); and Southern Berkshire (nearly every year; max 10 in 2004). Usually only one or two Question Marks are found at a given location, except for coastal areas where Question Marks sometimes gather during fall migration or arrive in spring. Many of the most productive locations are therefore coastal; in MBC records these include Aquinnah (Gay Head max 18 on 10/14/2000 M. Lynch+S.Carroll); Boston (various areas max 6 on 8/4/1994 B. Cassie, also Harbour Islands/George's Island 4 in 7/5/2001 B. Cassie); Chilmark (various areas, max 5 on 9/13/1998 M. Pelikan); Dartmouth (Allen's Pond Allen's Neck max 15 on 7/29/2007 E Nielsen); Edgartown (max 7 at Katama Plains 6/29/2001 M Pelikan); Gosnold (max 25 on Penikese Island 9/12/1998 J. Sones); Hingham (World's End TTOR max 49 on 5/12/2012 B. Bowker and L. Stillwell); Nahant (max 3 on 7/31/2003 D. Saffarewich); and Westport (Gooseberry Neck ) max 178 on 9/12/1998 B. Cassie; and 20 on 10/20/2000 R. Hildreth. Inland productive locations have been Greenfield (10 on 7/9/1994 R. Hildreth); Chelmsford power line max 8 on 5/19/2012 B. Bowker; Medford (Middlesex Fells max 4 on 6/27/1994 B. Malcolm); Newbury (var loc's max 10 Old Town Hill on 7/2/2012 M. Arey); Wales Norcross WS, max. 9 on 6/28/2012 E. Barry et al. ; Williamstown Mountain Meadow (max 6 on 5/14/2012 B. Zaremba); Northborough (Crane Swamp trail; 4 on 7/19/2009 S. Moore and B. Volkle); Northbridge Aldrich max 9 on 7/2/2012 B. Bowker; and Petersham (Quabbin Gate 40, 35 on 5/12/2012, B. Cassie). The latter is the most recent high from any single location away from the coast. They were reported actively migrating northeast. The Question Mark has a long flight period, extending from late March to mid-November according to MBC records (http://www.naba.org/chapters/nabambc/flight-dates-chart.asp). It over-winters as an adult. Earliest flight dates: In the 21 years of BOM-MBC records 1993-2013, the six earliest "first sightings" are 3/18/2012 Athol, D. Small; 3/20/2010 Newburyport, B. Zaremba and 3/20/2010 Sheffield, M. Lynch and S. Carroll (two reports from opposite ends of the state); 3/27/1998 E. Longmeadow, K. Parker; 4/5/2001 Middleboro, K. Holmes; 4/6/1999 Edgartown State Forest and W. Tisbury, M. Pelikan; and 4/8/2013 Holliston, R. Hildreth. The exceptionally warm springs of 2012 and 2010 are reflected in these records. The MAS Atlas had quoted an early date of 4/7/1987. Only two of these early reports are from coastal locations (W. Tisbury, Newburyport), so these could represent either local emergences or arriving migrants. Thus, in three of these 21 years, Question Marks arrived or emerged in late March. And in twelve of the 21 years 1993-2013, (over half of the years), the first reports of Question Marks in Massachusetts have been in April or earlier, according to BOM-MBC records. By the last week in May, Question Marks are already at their usual abundance level. Latest flight dates: In the same 21 years 1993-2013, the three latest "last sighting" dates are 11/11/2006, Dartmouth Allen’s Pond WS, E. Nielsen and 11/11/2006 Oak Bluffs, M. Pelikan; 11/9/2008 Westport Gooseberry Neck, E. Nielsen; and 11/4/2012 Templeton W. Howes and 11/4/2012 Salisbury G. Kessler. In the 21 years 1993-2013, there are the only four years with a last sighting in November, although the MAS Atlas quotes an additional late date of 13 November 1994 (no loc. ), so there may be five such years. In all but two of the other years 1993-2013, the last MBC sightings have been in October. In some but not all years, fairly large numbers of migrating Question Marks have been reported in the fall from Westport and other coastal migration traps: for example, 198 reported at Westport Gooseberry Neck 9/12/1998 B. Cassie; 25 on Gosnold Penikese Is. 9/12/1998 J. Sones; 7 at Westport on 9/25/1999 R. Hildreth, and 20 at Westport 10/20/2000 R. Hildreth. In all other years, although the Westport Gooseberry Neck location has been visited in September and October, no more than 1 or 2 migrating Question Marks have been reported. Question Mark has at least two broods in Massachusetts, but the broods are not reflected in any obvious abundance peaks in the MBC flight chart, and may be staggered. The general dates for the emergence of the winter brood, many of which migrate south in September and October, have not been determined in Massachusetts. Informal yard observations in 2011 in Newbury and Peabody indicated three broods, two summer broods and the winter brood emerging as early as August 1. There is no marked gap in sightings of Question Marks through the summer season, and the July mini-peak represents merely the greater effort put in on the NABA counts. There has been no systematic recording of the two color forms of the summer and the winter broods. There is no convincing estimate of what proportion of Question Marks migrates, and what proportion remains in the state over the winter. 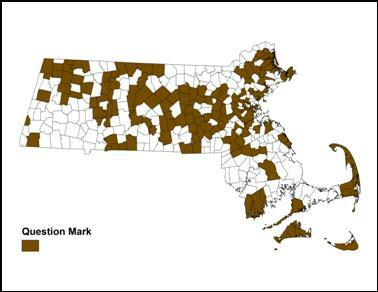 NatureServe ranks Question Mark as S5 or secure in most states throughout its eastern range, including Massachusetts. The species has several host plants which are common here, and at least two broods. In addition, the fact that part of the Massachusetts population over-winters south of here, and repopulates each spring may be an important safeguard in very harsh winters. Question Mark is strongly migratory, and may colonize almost any stand of suitable host plant, because short distances between them do not usually act as barriers. Interestingly, in areas south of about 40 degrees latitude (New York City, approx. ), there may be colonies of over-wintering individuals in forested areas without any known plant host nearby. Question Mark has a wide range across the eastern United States, south to Florida and Texas. Climate warming may not adversely affect it in our state. (For species affected by climate warming see Table 6).